The Quince Tree Press was established by J L Carr as the publishing house for a series of ‘Pocket Books’: small selections from the great poets (but exclusively those out of copyright); idiosyncratic Dictionaries, small Histories & volumes of Fabled Saying. Later a series of Wood Engravers, contemporary or near contemporary were added. The hand-drawn, poster-sized historical County Maps completed the early productions which together funded the self-employment which, in part, enabled the novels to be written. This small publishing firm continues as a family affair. The first six novels were initially published by conventional publishing houses, but as they went out of print the rights were reacquired and QTP editions produced. The last two novels ‘H&F’ and ‘Hetty’ were produced entirely in-house. An author’s desire to be independent of the frustrations and irritations of the conventional publishing world was probably the incentive, but it developed to a positive pleasure in the design and production of a volume complementary to the text - there is a degree of unconventionality about all the productions. JLC died in 1994 but the business remains within the family. Where he managed it part-time in conjunction with writing, we also continue our work as archaeologists, physiotherapists and journal editor. 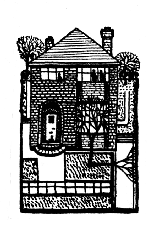 The original colophon; the house in Kettering where JLC and family lived. The quince stands in the front garden.